Bakers is the UK's most popular dog food, alone accounting for over a quarter of the market. 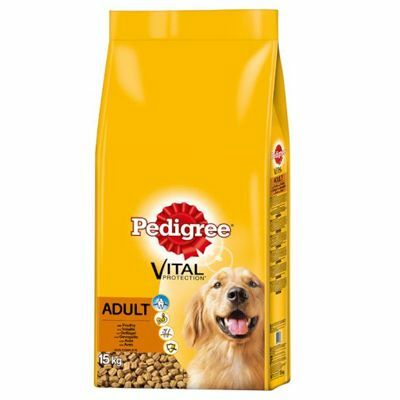 It is so widespread and comprehensively marketed that for many pet owners, it is the first and last brand that crosses their mind when considering food for their dog. Nestle Purina, who own Bakers (as well as many other pet food brands including Beneful, Beta, Bonio, Felix, Friskies, Just Right, ProPlan, Purina One, Purina Veterinary Diets and Winalot) are the world's second largest pet food producer only below Mars Petcare. But despite its success, Bakers has increasingly become a byword for low-grade pet food amongst pet nutritionists and more discerning pet owners - this unflattering reputation mostly stemming from the wide range of artificial additives used in the food and its extremely unclear ingredients list which made identifying any individual ingredients effectively impossible. Recently though, sensing the changing attitude of consumers, Purina have been taking some big steps to improve their formulas and address some of the criticism being directed their way. The changes started in 2016 when all of the artificial colours were replaced with natural alternatives and in 2018 Bakers removed the remaining added artificial flavours and preservatives from the recipe altogether whilst also increasing the food's meat and vegetable content. The new recipe is undoubtably a huge improvement and great news for the millions of dogs on the food so, and I never thought I would say this, well done Bakers! BUT, despite the improvements, Bakers still has plenty of issues. Most notably, the ingredient list is still just about as impenetrable as ever. Terms like 'cereals', 'meat and animal derivatives', 'derivatives of vegetable origin' and so on are so ambiguous that together they could account for virtually any ingredient imaginable. Broad umbrella terms like these are generally used to either mask less popular ingredients or to allow the manufacturer to alter the recipe depending on ingredient prices - which may help keep prices down but can also play havoc on dogs with sensitive digestion. While a few individual ingredients and their percentages are now identified, they still only provide a glimpse of the full picture. The listing 'Cereals (wholegrains 55% including min. 4% wheat and 4% maize)' for example gives no clue as to what cereals the remaining 47% of the listing is made up of. 15% meat is an improvement but it is still relatively low which is why vegetable protein extracts have to be added to boost the overall protein level. Vegetable proteins are not as easily digested by dogs as meat proteins so we don't like to see them used as protein supplements, especially when the source vegetable is not declared. And while all of the most contentious additives have been removed, the food still contains propylene glycol which is controversial mainly due to its links with asthma and allergic reactions. The cost of feeding Bakers has come down considerably (due to a combination of lower recommended feeding amounts and a reduced rrp) now making it one of the cheaper options out there. Nevertheless, it has to be said that you can still do a whole lot better in terms of ingredient quality and clarity at this price or even lower. Conclusion: The new recipe is a VAST improvement on the old but it still has a long way to go before we can recommend feeding it.